A federal ban, as well as pressure from environmental groups, seems to be reducing part of the chemical load that many of us carry in our bodies. A study, released Wednesday in the journal Environmental Health Perspectives, looks at a class of industrial chemicals called phthalates, used to make plastic soft and cosmetics more fragrant. While some phthalates are on the decline, others are increasing, raising concerns about how these chemicals affect human health, as the Chronicle and Mercury News reported today. 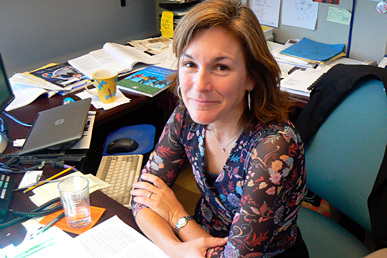 Tracey Woodruff, who directs the Program on Reproductive Health and the Environment at the University of California, San Francisco, and her team looked at urine samples collected over a ten-year period as part of the federally-funded National Health and Nutrition Examination Survey program – the same data that was used to show how a federal ban on lead in gasoline resulted in less lead in children’s bodies. KQED Science asked Woodruff whether she thinks current regulations on chemicals are working, and why it's a bad idea to put plastic dishware in the microwave. Why study phthalates this way? There's been a lot of interest in phthalates over the last ten-to-12 years. We wanted to see does this interest, both by advocacy groups and the government, make a difference? Do bans and education campaigns leave us with fewer chemicals in our bodies? When you say "interest," it's not like there have been widespread bans other than the ban on toys and kids products. But there’s been more media coverage of the topic, more advocacy group campaigns, etc. Is that what you mean? Yes, there’s been higher consumer awareness about phthalates, and that’s translated into changes in the marketplace in terms of what people are buying. There’s been a focus from advocacy groups, which have been working with industry to get them to remove some of these phthalates from their products. What do we know about how these chemicals affect human health? Well, there’s a range to how well some of these phthalates have been studied. The ones that have been banned (here’s more about those) have more studies on them. Several of those have been linked to adverse effects on male reproductive development. Some of them have also been linked to effects on sperm quality. And there are some studies that suggest that exposure to phthalates can alter behavior in children. Obviously, you can’t expose a child or a fetus to phthalates and see what happens. So how do we know this? Are these studies with rats? Or observational studies in people, that point to a correlation between amounts of chemicals and physical/behavioral changes? When we ban a chemical, what are we replacing it with? And how do we know that a replacement chemical is safer than what it replaces? The ways the laws are set up in the U.S., you don’t have to fully test a chemical before you substitute it for something else. So we’re always playing catch up. It’s a game of Whac-A-Mole with chemicals. A game of Whac-A-Mole with chemicals. Consumers hear often about products that have lead in them, in part because under California’s Prop. 65, those products have to be labeled. But with phthalates, it’s a little less clear where they are. Why is that? It’s easy to test for lead because we have a good test. It’s a little more tricky with the phthalates. And yes, Prop. 65 gives people an incentive to look for certain chemicals in products. What would be more efficient and better would be to know in advance what products these chemicals are going into, rather than waiting until they get onto the marketplace. Because once they're in the marketplace, if they pose a health risk, it’s too late. What’s the takeaway from your study? The takeaway for me is that if you find a chemical and identify it as posing a potential health risk, then we can take an action and actually see a reduction of the chemical in people’s bodies. But when it comes to the replacement chemicals, we may just be repeating the same cycle. Not microwaving plastics is a "common-sense approach." OK, so this last question, I’m going to exploit your expertise a bit, since it’s not directly related to the paper. Is it true that putting plastic dishware in the dishwasher or microwave breaks down the plastic, thereby releasing phthalates and other chemicals into food? It’s a little hard to talk about these things because while we know there can be migration of these chemicals (into food) under heating circumstances, for example, we don’t really know how much is migrating and to what extent. It's more of a common-sense, preventative approach than a science-based approach. These are things that are easy to do, and come with little cost.